Next up in The Ted Crow Challenge: The joys of wool cycling jerseys. These things rock. Wool excels in nearly any condition or temperature. Cyclists have been wearing wool since the early years of racing, Ted, so it's got a lot of history and cred. 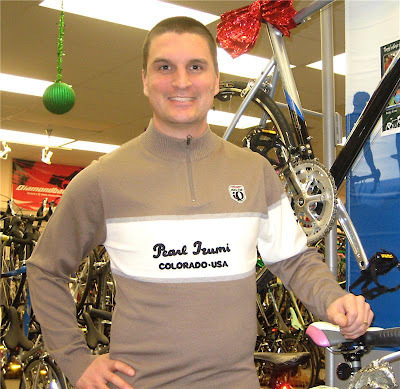 It's also why wool cycling jerseys are usually stylish, understated, and look retro-cool. Pearl Izumi Woolie Mammoth Jersey ($99.99): This is a great choice on or off the bike, featuring a polyester innerface for next-to-skin comfort. It breathes well and has a natural insulating ability, too. The Woolie Mammoth may also inspire your wife to cuddle on the couch with you, as opposed to fashion a weapon from her keys when she spots you from a distance in a parking lot.